to the next generation and permanently contribute to the population gene pool." 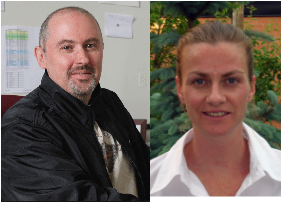 Carole Yauk, PhD, and Francesco Marchetti, PhD, both research scientists at Health Canada as well as adjunct professors at Carleton University, have been collaborating for six years on studies that test the impacts of environmental chemicals on mutations in germ cells. Yauk completed a PhD in Biology at McMaster University, where she studied inherited mutations occurring in birds living near steel mills. Her post-doctoral work at the University of Leicester with Sir Alec Jeffreys, inventor of DNA fingerprinting, developed new techniques to study sperm mutations in mice exposed to radiation and other mutagenic agents. Marchetti completed his PhD at the University of Rome. His work focused on chromosomal segregation in egg cells after chemical exposure. He continued this work during a postdoctoral position at the Louisiana State University Medical Center in Shreveport, Louisiana. During his second postdoctoral appointment at the Lawrence Livermore National Laboratory, he developed methods for studying the transmission of chromosomal abnormalities from male germ cells to offspring. What is the difference between mutagenesis and epimutagenesis? Yauk: Mutagenesis is a change in the DNA sequence while epimutagenesis is a modification to DNA without changing the sequence. Epigenetic changes include things like a methyl mark on DNA or a change in the way the DNA is packaged into chromatin. Epigenetic modifications change how genes are regulated (how much protein product they produce), whereas mutations can cause the protein product of the gene to not function correctly. While mutations are a permanent change, the stability of epigenetic changes is a big question--not all methylation changes will have an impact, and some have variable effects. We are still discovering new ways in which the epigenome is modified. We are in the early days in the field of epigenetics. Marchetti: Right now all we can do is guess about whether epigenetic mutations are more likely to persist in the population. Part of the controversy is that epigenetic markings on DNA can be erased during development, but sometimes they are put on again, and we don’t fully understand how this is happening. Until we understand the process better, it will be difficult to come to a firm conclusion about the impact of epigenetic changes on the germ line. Are epimutations more common, and if so how can we test for epigenetic impacts of exposures on the germline, and how do we know which ones lead to pathology? Yauk: Genetic mutations are very common. A human offspring will inherit about 70 new mutations from their parents! But because the genome is very large, these 70 new mutations may not impact coding DNA. Put another way, the rate of mutation per DNA base pair is low, and only a small portion of the genome is coding, which means there is a small chance that these mutations will fall in a sequence where they will have an impact. When mutations do have an impact, they sometimes stay hidden in the population until the child, who inherited the mutation, finally mates with another individual who shares a mutation in the same region. Marchetti: In addition, defects in chromosome number (e.g., aneuploidy) or structure (e.g., reciprocal translocations) are also very common. It is estimated that over 30% of all human conceptions end in a spontaneous abortion due to the presence of chromosomal abnormalities. Furthermore, Down Syndrome, which is due to the presence of an extra chromosome 21, is present in 1 out ~700 children and it is the most common chromosomal abnormality at birth. The role of chemical exposure in the etiology of these defects is still controversial. Yauk: An epimutation is a change in the methylation pattern of a gene that persists across generations. Epimutations may more broadly affect multiple DNA sites than a DNA sequence mutation. With a mutation, you affect the function of one single site in the DNA. With an epimutation, you can affect a larger region of the genome. This means that an epigenetic change is more likely to be seen in multiple individuals and their children, even though the specific locations of the epimutations may vary between individuals. In addition, where mutations are often diluted out by mating with non-mutants, epimutations appear to be more persistent. You are the lead author of ENIGMA—Environmentally Induced Germline Mutation Analysis working group. What is the history of ENIGMA, and what is your goal? Yauk: ENIGMA was founded in 2011 by Jack Bishop, of the National Institute of Environmental Health Sciences (NIEHS). The group brought toxicologists, computational biologists, and genomics researchers to Montreal to talk for two days in October, 2011. We addressed how new technologies coming on the market, like Next Generation Sequencing and DNA microarrays, which allow researchers to analyze an individual’s genome and also their epigenome, can be employed to study how chemical exposures may cause heritable effects. For decades scientists have been trying to discover chemical agents in the environment that cause an increase in mutations in the germ line. However, these research pursuits were largely unsuccessful primarily because the existing technologies were not sensitive enough to find relatively rare mutations that arise from an exposure. The typical approaches have been epidemiological – for example, researchers look for birth defects in the offspring of patients treated with chemotherapy or radiotherapy. With genomics tools, this question can be tackled in a whole new way. But genomics tools have thus far not been used to study the impacts of environmental exposures on heritable effects. Marchetti: The main question is, why are there proven germ cell mutagens in animals, but there is not a single chemical that has been established to be a human germ cell mutagen? ENIGMA’s goal is to harness tools used by the genomics community to detect rare genetic mutations or epigenetic effects in the children of individuals who have been exposed to environmental chemicals. During the 2011 meeting, ENIGMA put together recommendations to advance research in this area, including the application of genomics technologies in animal and human studies to establish baseline and sensitivity for detecting induced mutations, in parallel with identifying human populations for future studies, and developing biobanks of samples that can be leveraged for discussions about induced, inherited mutations. What are these new tools teaching us about germline mutations and human germline stability? Yauk: The paternal age effect is emerging as an extremely important mediator of germline stability. Work by Decode Genetics in 2012 demonstrated that older fathers pass on an average of two new mutations to their offspring for every year of their reproductive life. For example, a 50 year old dad would pass on 50 more mutations than a 25 year old father. A recent paper in JAMA Psychiatry looked at 2.9 million people and linked the age of the father to incredibly high odds ratios for things like bi-polar disorder, attention deficit disorder, and attention deficit hyperactivity. By comparing 45 year-old fathers to fathers who were between 20 and 24 when the mother gave birth, they suggest that there is a strong phenotypic effect of germline mutations or epigenetic changes passed on in the older males. We should now be extending these types of experiments to include investigations of parents who were highly exposed to potentially mutagenic agents prior to conception. What are we learning with regard to epigenetic mutations and environmental exposure? What are we learning from animal models? Marchetti: I’m not aware of studies that have investigated the effects of paternal ageing on inheritance of epigenetic changes. Similarly, there haven’t been investigations using these new technologies to determine whether parental germ line exposures modify the epigenome of their offspring. This is clearly a research gap and an area that requires attention. There are animal studies demonstrating that chemical exposures to the germ line can affect multiple subsequent generations through epigenetic changes. However, these studies are controversial and the underlying mechanisms that cause these effects are currently unknown. Do you consider germline vulnerabilities to be something of a blind spot in regulatory approaches? Marchetti: This is a question that would take two days to answer! We know that mutations in the germline are important, and that regulatory agencies do take germ cell mutations into account when classifying chemicals as potential germ cell mutagens. So in one respect germline mutagens are not a blind spot. But on the other hand, many people seem to believe that tests done in somatic cells (any cell type but the germ cell) are sufficient to answer questions about mutations that occur in germ cells. Part of the work we are doing is trying to answer the question – is it indeed true that if you regulate exposure levels based on effects in somatic cells, you by default protect germ cells from induced mutation? Or do germ cells respond differently than somatic cells? Depending on the answer to this question, this could have important implications for the regulation of chemicals. What exposures today are on your group’s shortlist for concern? Marchetti: We focus mostly on air pollution, some types of occupational exposure, on tobacco smoke, and on diet. Yauk: We focus less on defining environmental factors that cause germ cell mutation, and more on developing the best regulatory testing strategies to identify germ cell mutagens. We work with a lot of model chemicals to look at the sensitivity and specificity of different testing approaches. We are primarily working to develop new methods. Why does so much of your research focus on germ cells? Are you concerned that the germline is a particularly vulnerable phase of the human lifecycle? Marchetti: We think it’s important to understand whether germ cells respond differently from somatic cells to a chemical exposure because a change in the genome in the germ cell can be transmitted to the next generation and permanently contribute to the population gene pool. Yauk: There are many highly unique features of sperm and egg cells that are too numerous to list here. We could teach a course on it! However, it’s important to note that the general model for cancer is the requirement of multiple mutations. In contrast, a single mutation arising in a germ cell may profoundly affect the health of child, depending on where it occurs.